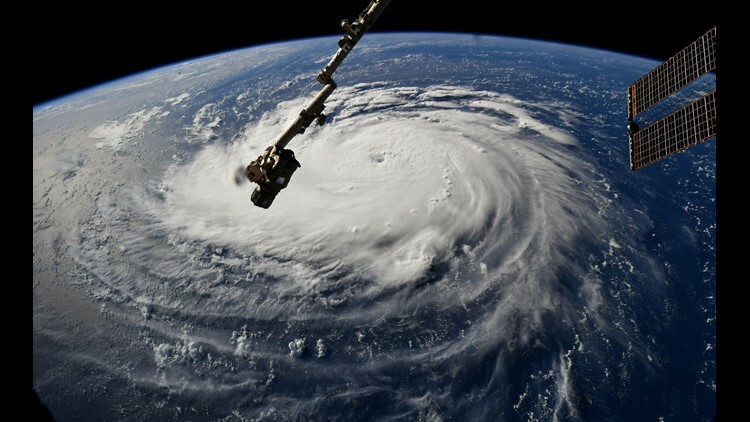 This NASA handout photo shows a view from the International Space Station of Hurricane Florence off the US east coast in the Atlantic Ocean on Sept. 10, 2018. 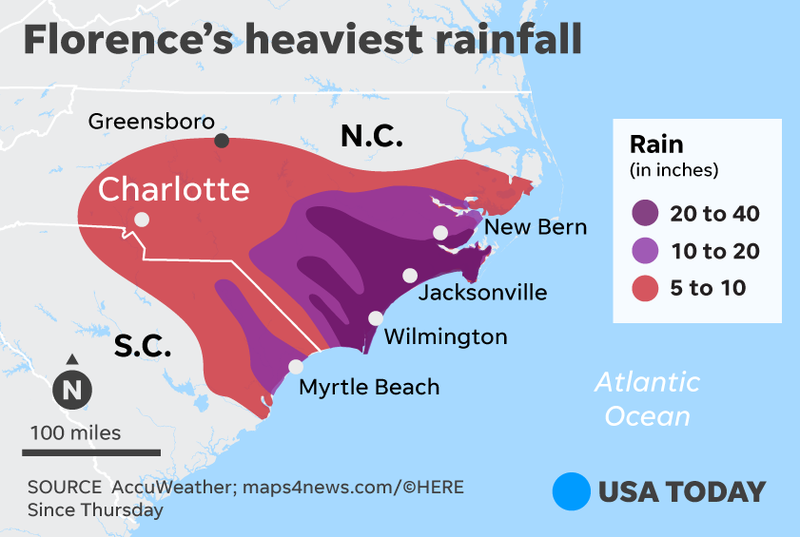 After a quiet start to the hurricane season, Hurricane Florence shattered the calm as it made a direct hit on the Carolinas on Friday. Drenching rain, howling winds and destructive ocean waves battered the region as the storm made landfall. Florence has stalled over the Carolinas and the Appalachians, bringing days of extremely heavy rain. 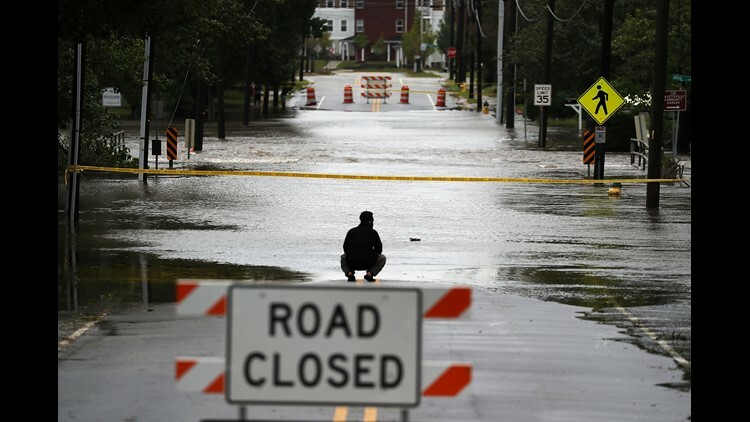 ► Florence is being blamed for at least 32 deaths in the Carolinas and Virginia. 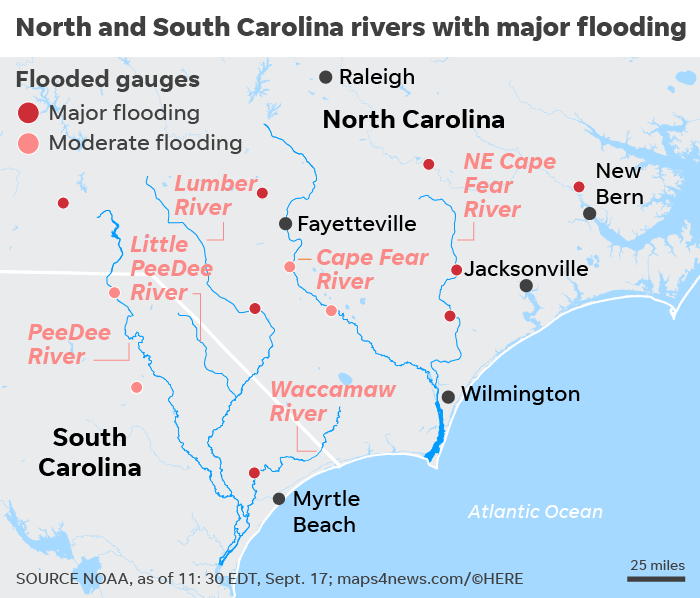 ► Tens of thousands have been ordered out of communities along North Carolina’s steadily rising rivers. 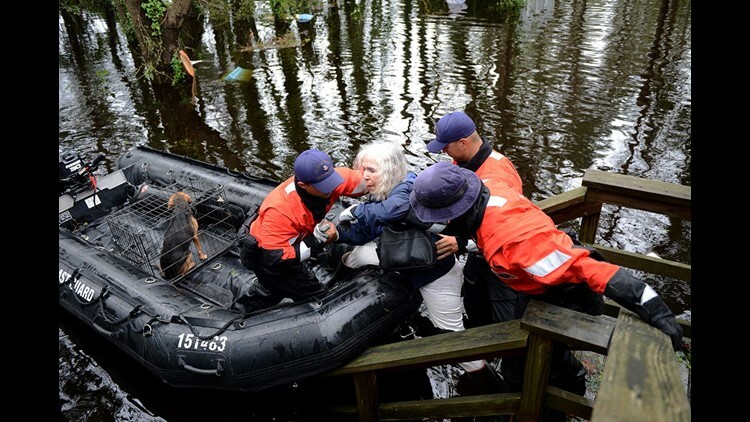 Members of Coast Guard rescue an elderly woman and her husband along with their pets in Brunswick County, N.C.
A washed out road in in Fayetteville, N.C.
About 1,200 North Carolina roads are closed, including 357 primary roads. Also, two of the U.S. government's river monitoring gauges stopped transmitting after waters reached 21.5 feet and 24.2 feet, and more gauges could fail as rivers continue rising. 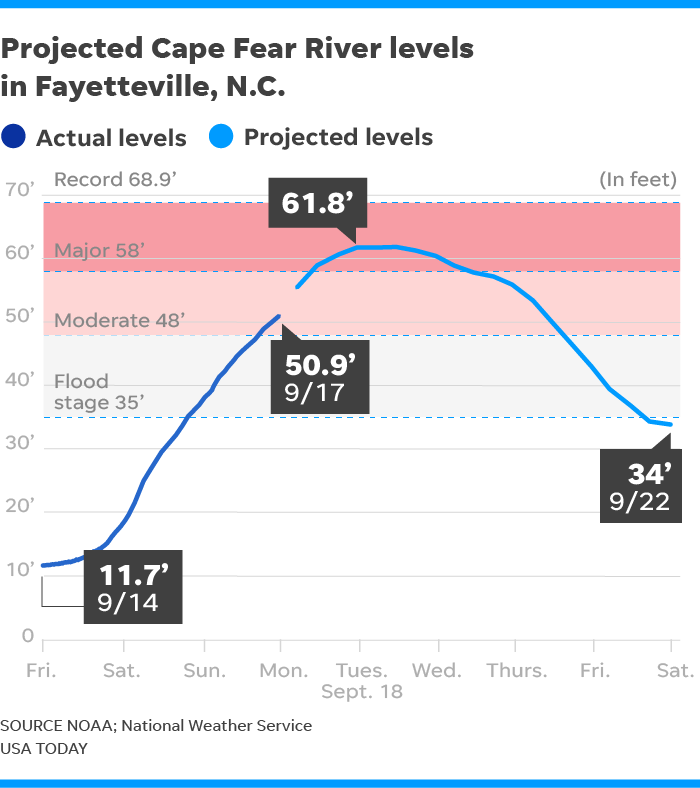 The city of Fayetteville, N.C., is bracing for the Cape Fear River to crest at near record levels in the next couple of days. The river runs through a portion of the city's downtown. 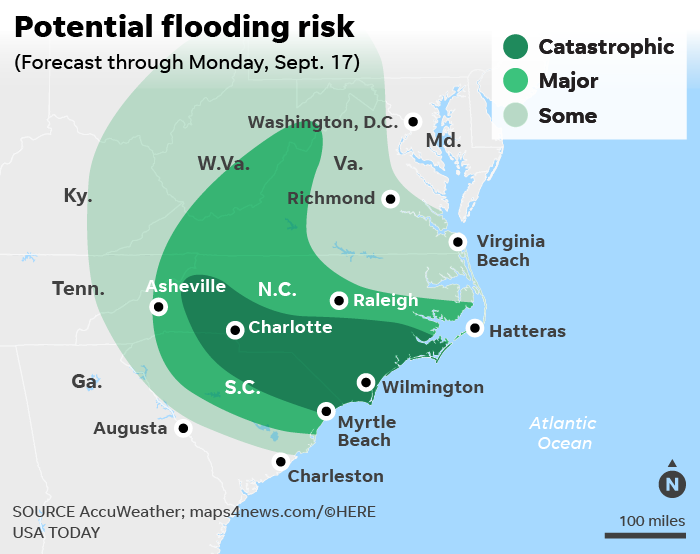 Days of drenching rain from Florence will likely lead to "catastrophic" flooding in both South Carolina and North Carolina. Most of the heaviest rain fell in eastern portions of the Carolinas. 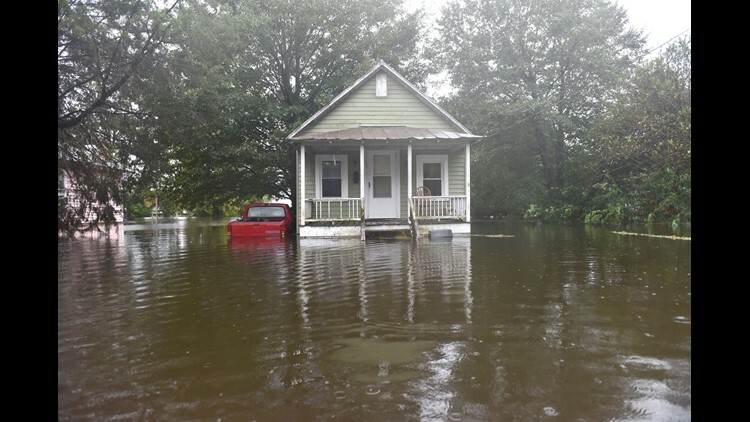 Nearly 34 inches of rain fell from Thursday through Sunday in Swansboro, on the North Carolina coast, according to the National Weather Service. 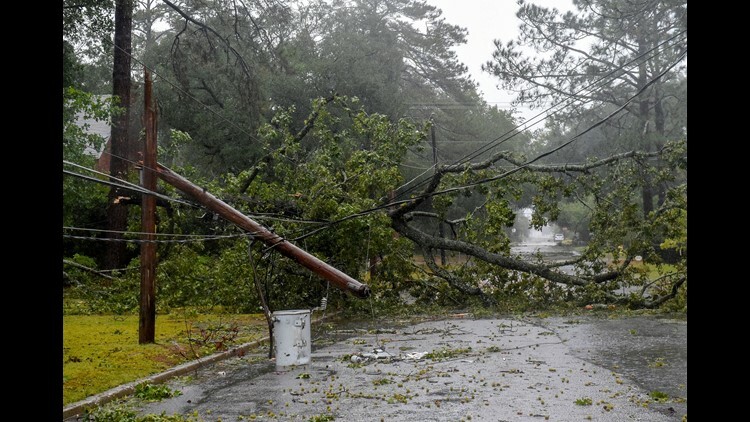 A combination of heavy rain and ferocious winds bring an extreme level of risk to lives and property, mainly across the Carolinas and Virginia. 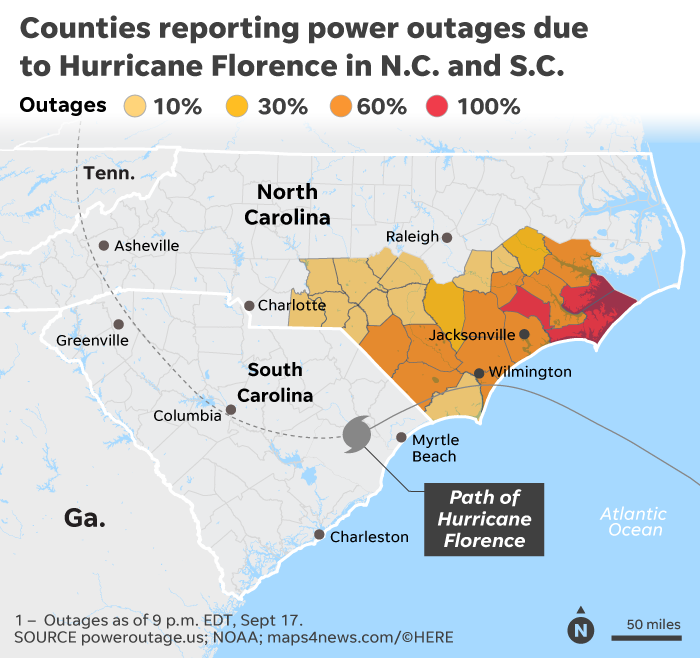 As of 5 p.m. on Monday, more than 400,000 customers — mostly in North Carolina —were without power, according to PowerOutage.US. How much damage will Florence do? 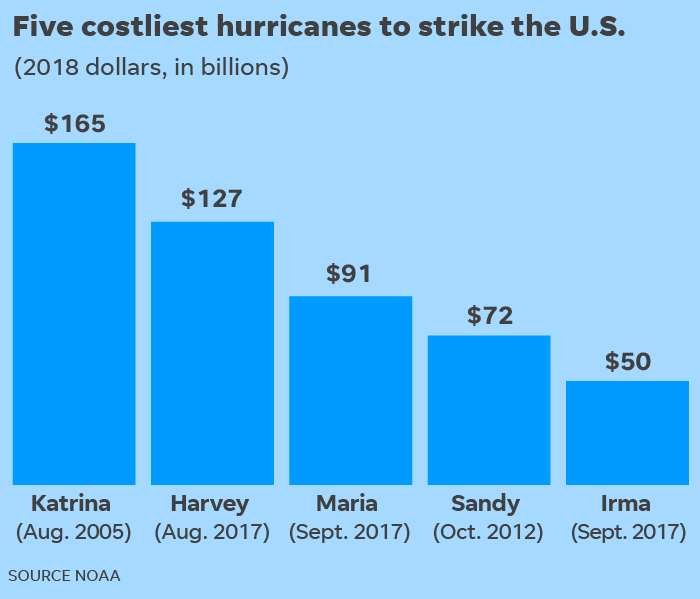 Three of the costliest hurricanes in U.S. history battered the U.S. in 2017. Florence may cause as much as $30-$50 billion in damages, according to one early estimate of the storm from AccuWeather. A motion graphic explains the elements that combined to form Florence and other hurricanes.